Roland RCC-10-US14 USB Instrument Analog to Digital Converter Cable.. 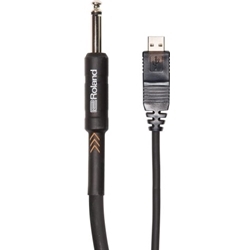 This special USB cable has a 1/4-inch plug on one end, allowing you to connect a line-level or instrument-level audio device directly to your computer. To connect a guitar with this cable, we recommended placing a buffered-bypass pedal (such as a BOSS compact pedal) in line. This cable is passive and relies on your computer's native USB audio support for operation.